Manila Water Foundation (MWF) and the Office of the Vice President (OVP) collaborate and commit to bring immediate relief to disaster-afflicted communities in the country via the provision of potable water during displacements. 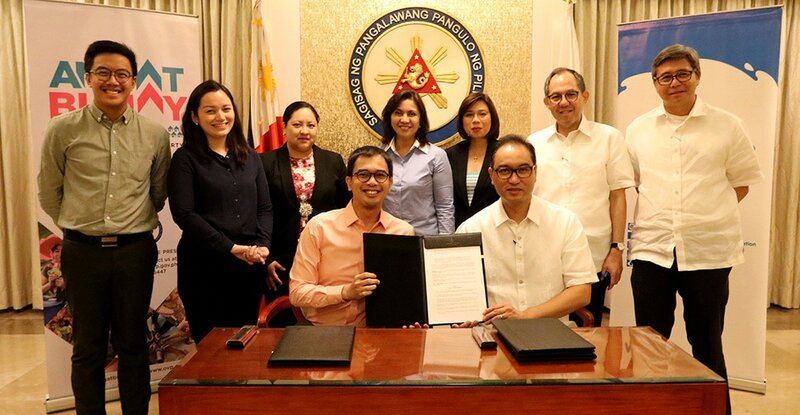 The agreement was signed by OVP Chief of Staff Philip Francis Dy and MWF Chairman Ferdinand Dela Cruz, and witnessed by Vice President Leni Robredo and MWF Executive Director Carla May Beriña-Kim. Joining them in the photo are (second row, L-R) OVP Program Officer and Angat Buhay Head for Disaster Risk Reduction Martin Magno, VP Spokesperson Georgina Hernandez, MWF Trustees Janine Carreon and Luis Juan Oreta, and MWF President Geodino Carpio. Manila Water Foundation (MWF) strengthened its relationship with the Office of the Vice President (OVP) as they formalized their partnership for a more strategic disaster response aimed at bringing immediate help for displaced Filipino families throughout the country. With this joint commitment, MWF will be able to reach out to more Filipino families who are afflicted by natural disasters more promptly. To formally start the partnership, the said organizations recently signed a memorandum of understanding (MOU) which signifies their commitment to answer the needs of calamity-stricken families. Having the same vision, the disaster response programs of both organizations are believed to complement each other. Via the Agapay Para Sa Barangay (APSB) program, MWF is equipped to supply potable water and mobile water treatment facilities should the need arise. On the other hand, OVP’s Angat Buhay program is capacitated to fulfill the logistical requirements of the APSB program through its other partners, specifically the timely delivery and distribution of the said relief for affected families in times of disaster. During the MOU signing, Manila Water Foundation Chairman Ferdinand Dela Cruz reiterated the importance of having OVP on board as an ally for the APSB program. “OVP answers our problem, which is the logistics side (of the APSB program). They would pick up the water bottles from our plants and deliver these timely to the affected communities. That’s really a big solution to the issues we have faced before,” said Dela Cruz. On the other hand, OVP shared the gravity of the need for potable water during displacement since this is the resource which is always adversely affected by calamities. With this, Vice President Leni Robredo expressed her thanks to Manila Water Foundation for being quick in responding to the call for potable water in disaster areas. Even before the partnership has been formalized, the OVP has acknowledged MWF’s positive contributions to the Angat Buhay program which was actualized during the OVP’s Partners’ Night. This recognition was positively received by MWF who also accepted the challenge to continuously be the face of hope and inspiration to Filipinos in need. Thus, aside from deploying immediate relief, the formalization of the two organizations’ partnership is a good start to explore other possibilities to collaborate. This is especially true for enabling sustainable and holistic development to the communities being supported by both organizations which was voiced out by MWF Executive Director Carla May Beriña-Kim during the event. “There is a lot of work that needs to be done but I am very happy that the OVP is willingly working with us to help BoP communities. Hopefully, we can also identify other areas of synergy where we can work on together towards holistic development,” Beriña-Kim said.